Uggah hanging a chicken cage to symbolically launch the competitors. Additionally seen are Rosey (third left) and Mohamad Azahar (fifth proper). 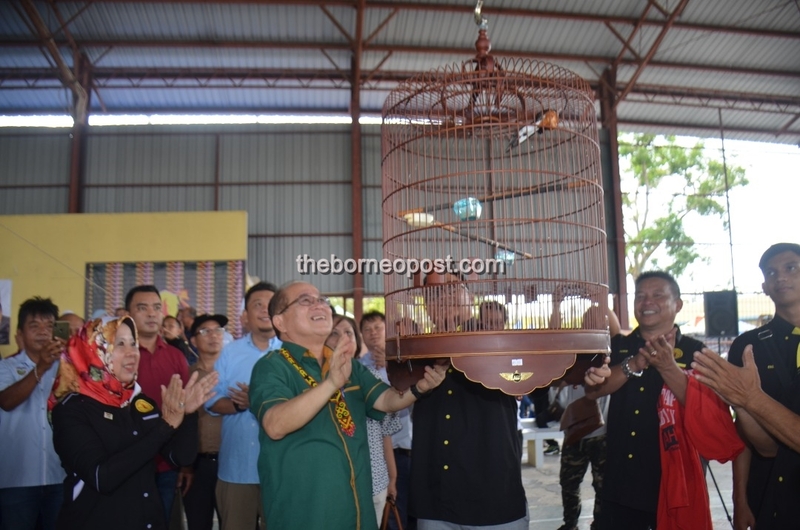 MIRI: The Rural Transformation Centre (RTC) in Bekenu and Betong will proceed to be in operation regardless of not receiving any funds from the federal authorities, stated Deputy Chief Minister Datuk Amar Douglas Uggah Embas. Uggah, who can be Minister of Modernisation of Agriculture, Native Land and Regional Improvement disclosed that each RTCs haven’t been receiving federal funds because the starting of this yr.
“These Rural Transformation Centres beforehand come below the Ministry of Rural Improvement. With the change of (federal) authorities, we have now been knowledgeable that for Sarawak they aren’t offering the financing anymore starting this yr.
“So, they stated they hand (the RTCs) over to the state authorities,” he stated when met throughout the officiating ceremony of Pertandingan Seni Suara dan Gaya Burung Kicau Seantero Borneo in Bekenu right here at present. In view of this, Uggah stated the Sarawak authorities had, over the past cupboard assembly, agreed to allocate RM380,000 yearly for the upkeep of the RTCs. “The explanation why is as a result of RTC is an important characteristic within the rural areas as a result of many providers can be found there and it has benefited variety of individuals,” he stated. Uggah stated the Sarawak authorities felt that you will need to maintain the RTCs. “Now, these RTCs comes below the state with state financing. So, RTC Bekenu and Betong will proceed to be opened,” he added. On the occasion, Uggah introduced an allocation of RM20,000 to Kelab Pencinta Burung Kicau Miri (Pekicau Miri) as a present of help for organising the occasion and for his or her future actions. Current have been Bekenu assemblywoman Rosey Yunus, Sibuti MP Lukanisman Awang Sauni and Pekicau Miri president Mohamad Azahar Bujang.